Incorporated on November 26, 1973, Palm Desert is a city located in the heart of the Coachella Valley, approximately 120 miles away from both Los Angeles and San Diego. One of California’s fastest growing cities in the 80s and 90s, Palm Desert serves as a retail and cultural center for the surrounding communities, and is a very popular destination for snowbirds flocking from some of the country’s colder areas – the city’s population increases by about 30,000 during the winter season. 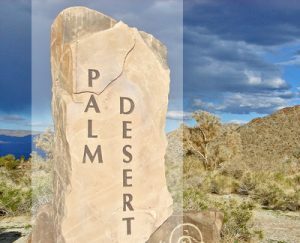 The city of Palm Desert was first known as the “Old MacDonald Ranch,” which was eventually changed to “Palm Village” in the 1920s, after an abundance of date palms were planted in the area. According to local historians, the very first residents of the area were the Cahuilla Native American farmers, who were part of the now-extinct San Cayetano tribe. Palm Desert’s first residential development was established in 1943, and was home to many residents working in an Army maintenance camp within the area. Later on, the same development was converted into an upscale shopping destination called “El Paseo,” which is one of the city’s top attractions today. The Palm Desert Corporation started its real estate developments in the area in 1948, giving the city its present name in 1951. The city of Palm Desert boasts an exciting real estate market, with a wide array of homes that blend seamlessly with the city’s stunning environment. Buyers looking for the perfect home can choose from affordable townhomes and condos, stylish single-family homes, impressive luxury desert abodes and nearly everything in between. There’s a diverse selection of property types available in Palm Desert that can suit any type of lifestyle. If you love playing golf, there are numerous golf and country club communities for you to choose from as well. Homes in Palm Desert feature a seamless balance between functionality and style. You’ll be able to choose from an assortment of elegant architectural styles, including Spanish Colonial, Mediterranean, mid-century modern, and even some traditional New American styles. El Paseo is Palm Desert’s answer to the iconic Rodeo Drive in Beverly Hills. The vibrant mile-long retail destination features boutiques from some of the most prestigious names in the fashion industry, along with colorful murals, fascinating art pieces, and art galleries exhibiting the work of talented local artisans. Palm Desert is known for its picturesque scenery – a desert paradise surrounded by breathtaking views of the Salton Sea and the majestic San Jacinto and Santa Rosa mountains. If you’re new to the area, a relaxing sunset cruise along Highway 74 serves as the perfect introduction to this scenic desert community. The Desert Willow Golf Resort is one of the best golfing destinations in Palm Desert. The resort features two championship golf courses designed by top architects Dana Fry and Michael Hurzdan, as well as an amenity loaded clubhouse, first-class service, and gorgeous mountain and desert views. Your dream home in Palm Desert is waiting for you! If you’re ready to begin your search, call us at California Lifestyle Realty at 760.564.1200. You can also send us an email at info(at)califestylerealty(dotted)com.